Why Choose Spick ‘N’ Span Services? Home•Why Choose Spick ‘N’ Span Services? With so many options, what makes Spick ‘N’ Span Services stand out as the right choice? We pride ourselves on the personal service we provide. We’re a local business who you can build a relationship with. We know our customers by name, not by a customer number. Every service we provide, whether commercial or domestic, we tailor it to meet our customers’ requirements. We don’t believe in a one size fits all solution. Our team are polite, punctual and efficient. To ensure reliability and consistency, we directly employ our staff (not through an agency) so they work together as a team. You will always recognise our team by their distinctive uniform. With our extensive experience and our professional cleaning team, you can be sure of a consistent, reliable and thorough service. Spick ‘N’ Span Services has an excellent safety record. This has been recognised by our accreditation by Safe Contractor for our commitment to achieving excellence in health and safety. 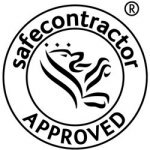 Safe Contractor is a leading third-party accreditation scheme which recognises very high standards in health and safety management amongst UK contractors. We believe that good communication with our customers is paramount in providing excellent customer service. Therefore our office phone has an “out of hours” service 24 hours a day, seven days a week. All messages are relayed to a member of our team, who will respond to your enquiry within 24 hours (48 hours at a weekend). We know life isn’t always straightforward, which is why flexibility is key. To ensure we are able to respond to changes when we need to we are in contact with our team throughout the day. We have the flexibility to complete ad hoc cleaning jobs within a few days and often quicker in an emergency. Whether it’s a one-off spring clean or a regular contract we can tailor our service to your premises and requirements. Spick ‘N’ Span Services include everything from general cleaning, windows, guttering to grounds maintenance. Our team come equipped with the knowledge, the experience the tools and the products to get the job done. When looking for a cleaner, professionalism is key, whether you are looking for domestic cleaning or commercial cleaning, we provide professional cleaners, with a professional attitude. We are proud members of the National Carpet Cleaners Association (NCCA), the Federation of Window Cleaners (FWC) and the Institute of Inspection Cleaning and Restoration (IICRC). These professional bodies hold their members to very high standards and specify strict guidelines which we must adhere to in order to retain our memberships. We know that when it comes to booking a service, you want the price to be right. Everyone has different requirements and different budgets, which is why we don’t offer ‘off the peg’ quotes. In order to provide the best service, at the best price, a member of our team will visit you and discuss your requirements and budget. We will then tailor our services to meet your requirements. This quotation is completely free and there is no obligation. No one likes a nasty surprise! That’s why we include everything in the quoted price. Our prices include cleaning materials, labour and equipment. There’s also no need to worry because all our work is fully insured.